1 meter with henna motifs drawings Berbers. If you want to merge onto little beauty of Moroccan daily life into you, Morocco henna leather lamps May be just what you are looking for. These unique items Fabulously impress guests as well Will add a little Color to your life. Placed anywhere in your home, You Will Be Sure to Have A Work Of Art That Will create a beautiful focal point, Along With a great conversation piece. Before you purchase Morocco henna leather lamps and Stock, You Should Know About the area a little From Where They Are created. After all, These home accents garnish a lot of Will Attention, So You Should Have questions answers to your friends and family when to inquire Members About Them. 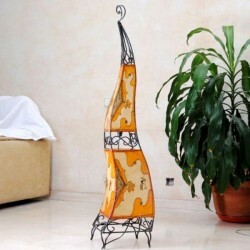 If you plan to own Morocco henna leather lamps, it is important to know Exactly what is henna. Actually the name is Henna of a flowing plant. Its dye is extracted from the dried leaves and petioles of the plant. Henna dye is Typically Used for decorative art on the hands and feet, But is Also Used to apply imaginative and Distinctive designs to leather lamps and lanterns. Otherwise Known as Mehndi, This type of art is very popular in India, Bangladesh, North Africa (Morocco) and the Middle East. Although more popular in the aforementioned areas, henna is Gaining more and more notoriety in North America due to STI intricate, yet Subtle, beauty. If the lamp you choose to purchase eat from Morocco, chances are Almost 100 Percent That It Was Made by professional artisan hands. This is why Morocco henna leather lamp home and is Completely unique. You Will not find the identical design on two Separate henna lamps. Typically made from goatskin, Each section of material is hand-tied to the frame and the leather is painted Moroccan henna With The. These lamps eat in Many Different sizes and shapes. Can you hang a huge Morocco henna leather lamp from the ceiling. Or, Perhaps you want a small pieces to accent a table in your bedroom. If That is the case, place a gorgeous, small table lampbeside your bed. The use for These stunning lamps are endless. The kingdom of Morocco is a beautiful country Located in North Africa. It borders Spain and the Mediterranean Sea to the North, Algeria to the East, and the Atlantic Ocean to the West. Morocco is a Constitutional monarchy Known as, Where a king or head of state is Elected by the people. Unlikable the United Kingdom, Which is Also a Constitutional monarchy, the monarch have Vast executive powers. European Countries, France and Spain Such as, Have Tremendous Influence in Morocco HAD. In Fact, Until the late 1950s, France and Spain in Morocco Both owned territories. Obtaining Once STI Independence, Morocco WAS in a state of Political unrest. It Was Not Until the late 1990s tentative Political Reform That WAS established. 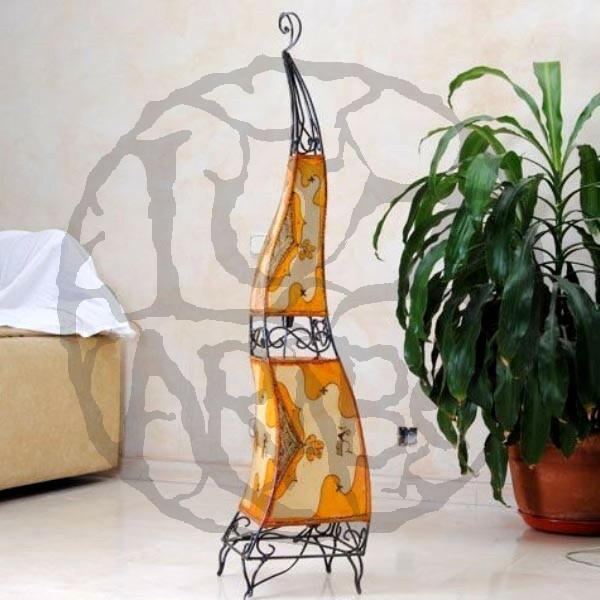 Morocco henna leather lamps add warmth and Will colors to you home or apartment, while an ethnic flair Adding That Will Set Your place apart from the rest. There Is No Doubt That These Will Never Lose Their lamps style.